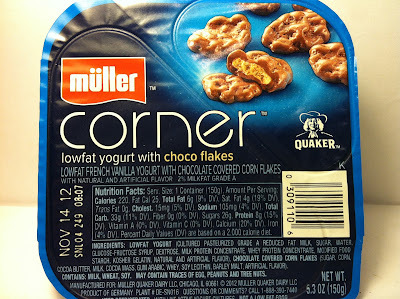 Here I come from right around the corner with another review of a Muller Corner product. Okay, that might be the most cheesy and stupid intro I've ever written. I feel like one of those dopey press agents that tries to think of cute ways to tie their product name to things. So, enough of that. I picked up this Muller Corner Lowfat Yogurt with Choco Flakes as part of the big Muller introductory sale at Kroger for $1.00. It's 5.3 ounces and has 220 calories and eight grams of protein. Armed with the typical Corner sidecar design, this Corner product is slightly different than the previous ones that I've reviewed in the fact that instead of a fruit mix-in, this has got a candy like mix-in with the addition of the Choco Flakes. Also different in this one is that the yogurt itself is not just plain lowfat yogurt, but instead is a French Vanilla lowfat yogurt and being that I love vanilla and also French Vanilla, I'm pretty geeked about that, especially after the aromatic and wonderful smell of vanilla that permeated from the yogurt itself. The yogurt seemed thicker than a typical lowfat yogurt, but not all that much thicker. The Choco Flakes themselves were more of a chocolate covered rice cake and the chocolate covering was extremely thick and had a wonderful smell of sweet chocolate. In terms of size, they were slightly smaller than a dime, so Muller definitely was not shorting anyone in that department. 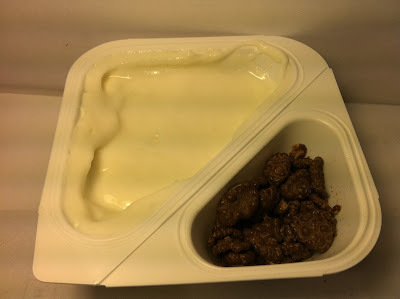 After smelling both the yogurt and the flakes in this, I would have eaten the plastic container if it was all I had and it had the smell of these two things. Yes, it was that appealing. The smell translated into the taste as well as this was everything I could have asked for and more. It was a simple recipe, but the French Vanilla yogurt was everything I could have asked for. Not wonderful, but a more than solid effort in that I could definitely taste the vanilla in the yogurt and the yogurt itself was fairly creamy and not at all flat like some lowfat yogurts can tend to be. The Choco Flakes had a nice sweet flavoring of sweet milk chocolate and also a nice crunch provided by the interior flake. When I mixed the two together, I got that old stand-by of a combination of chocolate and vanilla and it was a flavorful one. The flakes brought decadent crunch to the sweet and aromatically flavored vanilla yogurt and they worked perfectly hand in hand to provide a nice treat. Buy It or Fly By It? While I'm not going to rate this as the best yogurt mixture that I've ever had, I will say it is darn good and give it a BUY IT rating. The flavor combination worked well together and when you really look at it, this was more of a dessert yogurt than an actual healthy yogurt and I'm fine with that. It's also a fun flavor to eat too since the flakes provide the occasional crunch and since this is so fun, I think kids would have a blast eating it. I sometimes like to think of myself as a big kid and I know that I certainly enjoyed eating it. If I had to make one extremely minor complaint, I just wish that there had been more Choco Flakes. I've talked about my love of mix-ins in my ice cream reviews, so if this yogurt had contained more mix-ins, I may have put it in legendary status. Instead, it just stays in the quite good category. So what would you say is that best yogurt mixture you've ever had? Either pre-packaged or self-concocted. I don't know if it was the best I ever had, but I once took some Bell Plantation PB2 and mixed it in with some Dannon Light & Fit vanilla yogurt and then sprinkled some raisins in. My eyes just about rolled back in my head after eating that one because it was DELICIOUS.